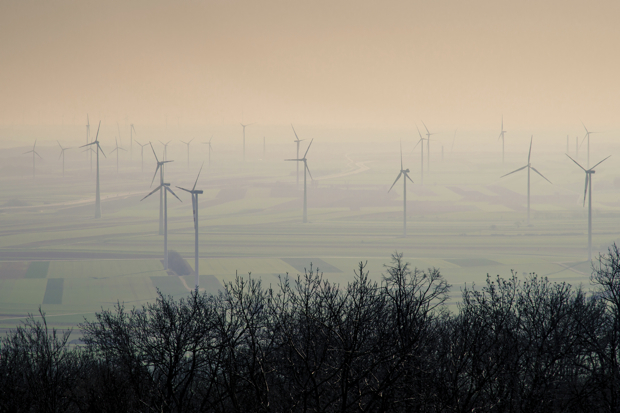 filed: April 10, 2014 • Opinions, U.K.
Why can’t country views be protected from wind turbines? ‘Surprisingly’, writes Geoffrey Lean (Daily Telegraph, 4 April), ‘two thirds of the country support onshore wind turbines’. It should not surprise him: those would be the two thirds who live in towns and cities, the people whose distinctive, familiar skylines are on the whole safe. When proposed city structures reach the height of St Paul’s they are the subject of deliberation and careful design. Not so in the country. I live in the East Mendips, a soft target for onshore wind turbines as it has little protection from developers: this is because its hills were sacrificed to quarrying after the war and it therefore does not qualify as an area of outstanding natural beauty. And yet it is outstandingly beautiful. Like many other areas of rural England, its character is unique, its many highly individual villages set among the wooded ridges, dips and valleys of an undulating limestone landscape where copses, church towers and outcrops on the varying skyline are particularly important. It is currently undergoing an economic revival: families and businesses are relocating here from the crowded south-east, and tourism increases every year. Again, like much of rural England, its character has been preserved for centuries by countless anonymous curators – charities, village enterprises, churchwardens, smallholders, heritage groups, local councillors – who monitor and consider every new development in the light of a social and visual context they care deeply about. To these people and their neighbourhoods, the random imposition of standardised industrial structures so breathtakingly out of proportion, so permanently visible and so impervious to local human scale is a shockingly barbaric act of government vandalism. The relentlessly utilitarian case for siting them indiscriminately throughout the country ignores objections on what are dismissed as unquantifiable ‘aesthetic’ grounds. ‘Visual impact’ is considered only in the light of officially listed buildings, but never in relation to the village streets, fields, cottages, rivers, vistas, paddocks and country lanes, which all have what Gerard Manley Hopkins once called their own ‘sweet especial’ beauty. The ignored appeals of people who value these things can be found by googling the name of any populated area in England that hosts a wind turbine. The majority of the crowds squeezing in to demonstrate their opposition at district council planning meetings in this part of Somerset, and indeed all over the country, are not wealthy property owners – they are ordinary country people from all walks of life, angry, frightened and impotent in the face of what is happening to their surroundings. The vital importance of consulting local communities was taken far more seriously in the 2012 policy briefing document from the Grantham Research Institute than it is by current government ministers, glibly parroting an increasingly simplistic green agenda. This document accepts that, right across Europe, communities would pay not to be near wind turbines, and that the successful model abroad is for turbines to be built by and for local communities, rather than as here, in overcrowded England, by insensitive developers. Here, in spite of government rhetoric, the idea of local consultation has become a joke. There has been a dramatic increase in cases going to appeal (42 cases this January, as opposed to 16 in January last year), yet approval by government inspectors remains at a steady 50 per cent, while the inspector likely to review the latest Mendip cases has a record of 70.5 per cent approval. Earlier this year, an area of Cumbria was described by the inspectors as ‘a wind farm landscape’; the very different landscape of Mendip, with at least 14 applications in the pipeline, looks as if it is going the same way. The irony, as everyone knows, is that the ill-considered and crude solution of siting onshore wind turbines indiscriminately across the densely populated British Isles is being swiftly overtaken by new, cheaper and more efficient forms of alternative energy; yet once built these structures will stand for 25 years, while the hundreds of tons of concrete and steel foundation will never be removed. Aware of their brief window of opportunity, developers are grabbing our subsidies while they can, and driving through a rapid succession of randomly sited applications in partnership with those property owners who are unable to resist the huge, publicly funded incentives for siting them on their land. The final insult is the arrogant assertion by those who do not live near them that wind turbines must be accepted because they are ‘beautiful’. A structure is beautiful only in relation to its surroundings. Seen briefly on remote hillsides from a passing car, turbines might look beautiful; but as neighbourhood features, dwarfing familiar and much-loved surroundings – say, Hyde Park or Hampstead Heath – they look rather different. ‘Going, going’, Philip Larkin’s lament for the death of the English countryside, slams the blinkered mentality that measures the character of England purely in terms of utility and cash, that sees no value in ‘the unspoilt dales/ … /The shadows, the meadows, the lanes’. He would no doubt have relished the fact that the profiteers’ latest wrecking ball is being swung in the name of ‘green’ policy. He thought the end, the irretrievable loss, was coming soon, and he was right. If these vast turbines go on to dominate the horizons of other counties in the way they are already set to dominate East Mendip, then ‘that will be England gone’.